Wacky as many people, especially in the UK, consider it, our family co-sleeps. we have a big bed set-up, with a king size and a single pushed together giving us an 8 foot wide bed. Well, on sunday night Esme moved out!! she has moved into the little pink bedroom she has always called her own. Now I am planning to girl-ify it even more for her, she is such a grown-up girl. and people told me I would never get them out of my bed (to which I always replied that I didn't mind them there in the first place.) I have never understood why we force our babies and children to sleep alone. And when they are ready for independence they take it themselves. Oh fancy esme moving out of the huge bed!! You know all the other kids will want to move out into their own bedrooms too soon. You'd better start decorating room's for them all!! You know it really seems more natural, if you look back in time, that's how it used to be done. It must increase bonding and closeness (not just literal). What a cute face in the photo, so sweet. We do/did the same thing. Caleb still sleeps with us most nights, but Logan always starts out in his own room. If he wakes up in the middle of the night he sometimes climbs into bed with us, but it's rare anymore. My son did the same thing. When he was ready to be on his own, he went. 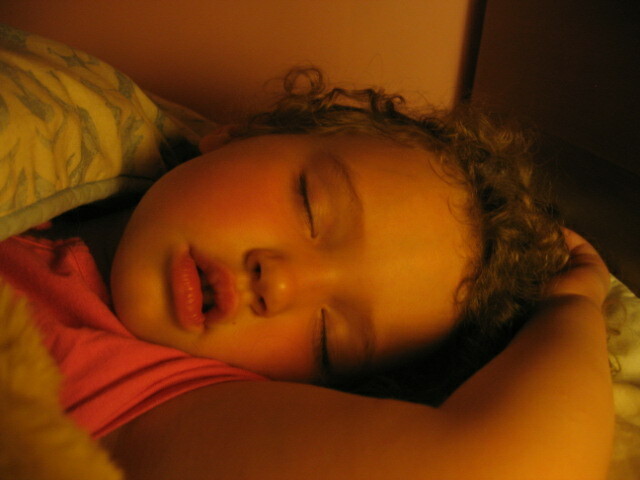 What a beautiful sleeping angel! !